As governments and individuals struggle to make informed and well-considered public policy decisions on the issue of healthcare it is becoming increasingly important that they take into account the state of Canadian marriages. Marriage is Good for Your Health examines more than 50 published, empirical studies on the correlation between marital status and health. An overwhelmingly large majority of the studies indicates that married couples are happier, healthier, and live longer than those who are not married. Moreover, there is strong research to back the conclusion that the quality of a marriage is a critical variable in the health benefits that couples enjoy. Marriage is a private choice, but it has public consequences for the Canadian healthcare system. Canadians' declining participation in marriage isn't merely a statistical trend. 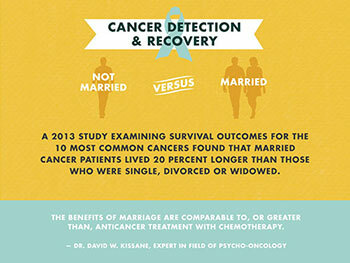 Given that marriage has been found to be a factor in better cancer recovery and fewer cardiac problems, should it not be considered a public health issue? Could public policy that supports and improves the quality of Canadian marriages not lead to lower costs for the public health system? Governments, religious institutions, the medical profession, and communities all need to be aware that marriage is an important factor in individuals' health outcomes. If these groups understand the relationship between marital status and illness, healthcare can be improved both for those who are married and those who are not. Download the report using the sidebar button on the right.